With Khutjo Green at the auditions. One of the main outcomes for my current residency at the University of Pretoria is a play on the Sustainable Development Goals (SDGs). How does one write a play about 17 broad goals with a total of 169 targets? Most people do not know about the SDGs let alone their content, so, should the play be educative? I've sought to answer this question by writing it as an adult fairy tale based on the children's story Little Red Riding Hood and the Big Bad Wolf. 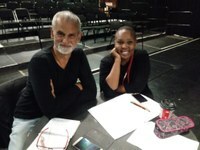 Khutjo Green, the director of the show, and I conducted the first round of auditions with University of Pretoria drama students on Friday 12 April. There was certainly enough talent from which to make a selection of a cast of 8 who will present the show at the National Arts Festival in Makhanda in late June, early July.